"I don't know how one of the kindest people I've ever met came out of human garbage like you." Ouch. You should see the way Ryan's Dad's shoulders stoop in the wake of that pithy put-down. He deserved it, though. EXPECTING TO FLY #1 was a belter. Set inextricably in Britain, 1996, it saw Shelley Winters cope with loss, Ryan Beckwith attempting to cope with an errant yet distracting Dad, and Tim Jones sailing through school with flying colours. It was smart, sassy, bright and breezy with barely a hint of what's in store here. Oh my days, this is dark! Don't get me wrong, it's still as funny as ever: John Allison's timing on each page released first online, one at a time, is immaculate. Sometimes the punchline is verbal, often it's visual, but every page comes with one which makes the final printed copies amongst the tautest comics ever released. 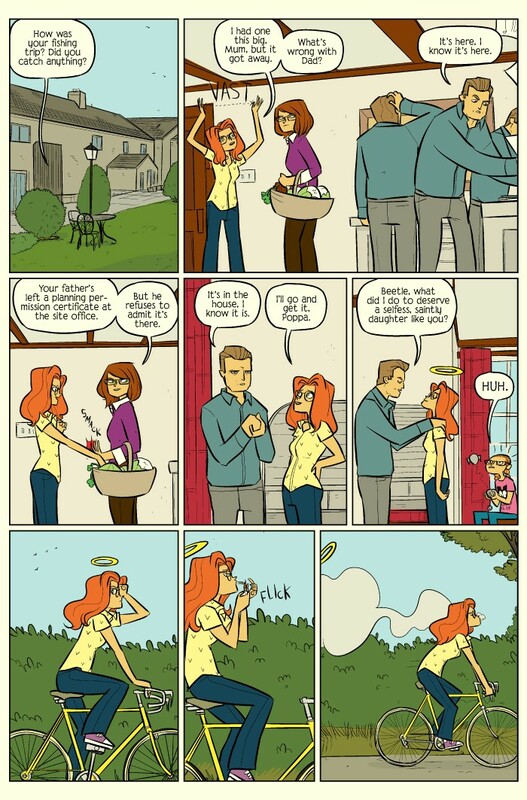 Same goes for the man's BAD MACHINERY. Pop in him our search engine and see what crops up. At the moment John's comics are all on our counter corner and shooting out. It all looks so casually done but you can only look this casual when your craft is rigorous. Expressions like bewilderment, mock self-righteousness, delight and despair are matched only with the flamboyance of gestures or tiny, telling postures. 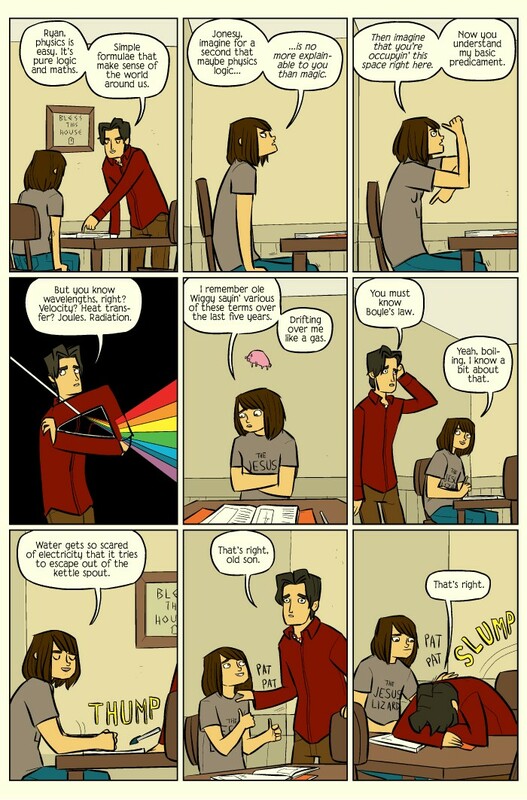 I also loved the panel in which Tim tries to explain the mysteries of light physics, folding his arms into a prism so dispersing white light into a refracted spectrum, and the sequence when Shelley starts smoking and her hard-earned halo is left to drift off into the sky. Everyday observations are lobbed in like they're obvious but aren't. Ryan's been looking after Shelley and here takes her fishing. "I brought you a bacon and egg sandwich. Thought you might need some strength." "Ryan, I think fishing is cruel. I don't know if I wanna catch a fish." "You're basically eating a piglet's dad and a chicken's son." Meanwhile, Ryan's home work has been suffering on account of his dad's self-indulgence, taking him out to the pub and getting him drunk on Ryan's own pocket money. But if you imagine he's been led astray so far, you haven't seen anything yet. Then there are the repercussions of Tim's elaborate act of kindness in helping Ryan grasp basic physics and by the end of this comic everything has changed at home, at school, at work. I wasn't expecting that at all. Radical. 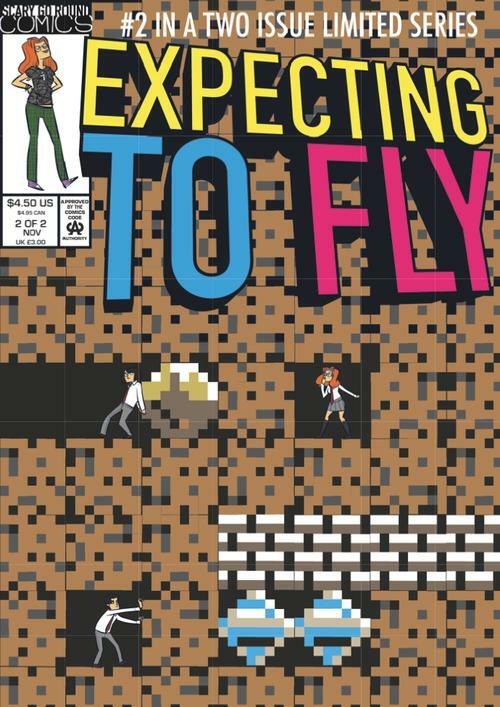 As a bonus John Allison has spent both issues winking at 1990s' Marvel Comics on the covers and within, emulating their monthly marketing page with a mock editorial and check list of comics like SURFEIT (*snorts*) and a 12-issue mini-series which spins out into other titles called ENTER THE TAXMAN. "Every year, the IRS turn me inside out. They work me over like a sailor's Johnson on shore leave. I heard that possession is 9/10 of the law, but try telling that to them!" 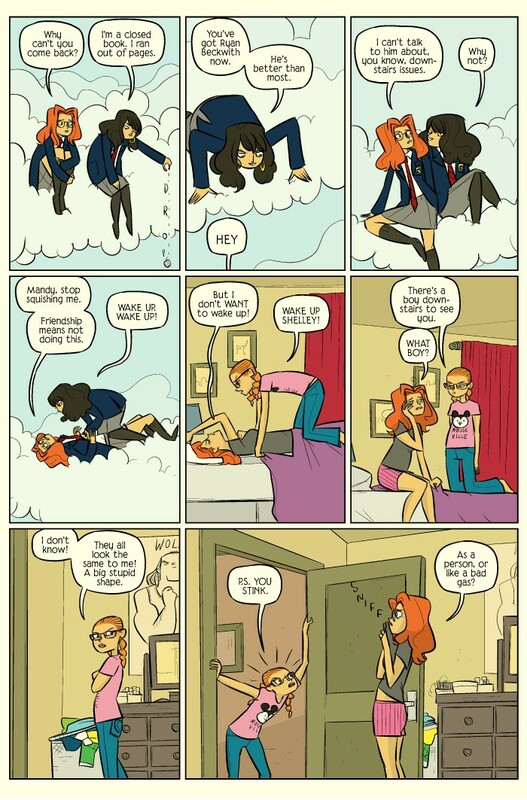 There lies the inspiration but you won't believe it impacts on Scary Go Round's other titles! Lastly, back to the fishing expedition and Shelley is curious. "Have you ever caught crabs?"